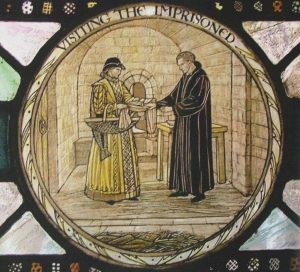 One of the liturgical memorials we observe today is that of the collective of Saints Margaret Clitherow, Anne Line, and Margaret Ward. All are martyrs. These three are also sometimes lumped with 284 other canonized or beatified martyrs of the English Reformation on 4 May but some of the canonized are recalled today. The liturgical calendars for England and Wales are particular. 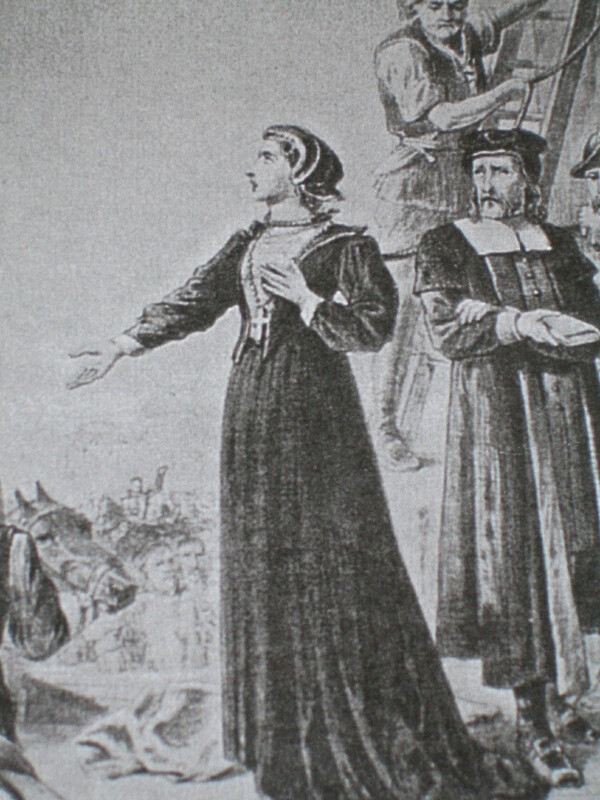 Margaret Clitherow died at age 30 on March 25, 1586, her last words being, “Jesu, Jesu, Jesu, have mercy on me!” She was canonized in 1970 with 39 others. As a group they are known as the 40 Martyrs of England and Wales. These martyred men and women were killed between 1535 and 1679. A few words on Saint Margaret Ward and her servant, Blessed John Roche. They were arrested for helping Father Richard Watson escape from Bridewell Prison smuggling him a rope and helping him once he was outside. She can be said to be an apostle of the works of mercy, especially visiting the imprisoned. The personal servant of Saint Margaret Ward, John Roche, helped Father Richard Watson, escape by meeting him outside the prison with a boat, then changing clothes to throw off the witch hunt. It was a crime to aid a priest. 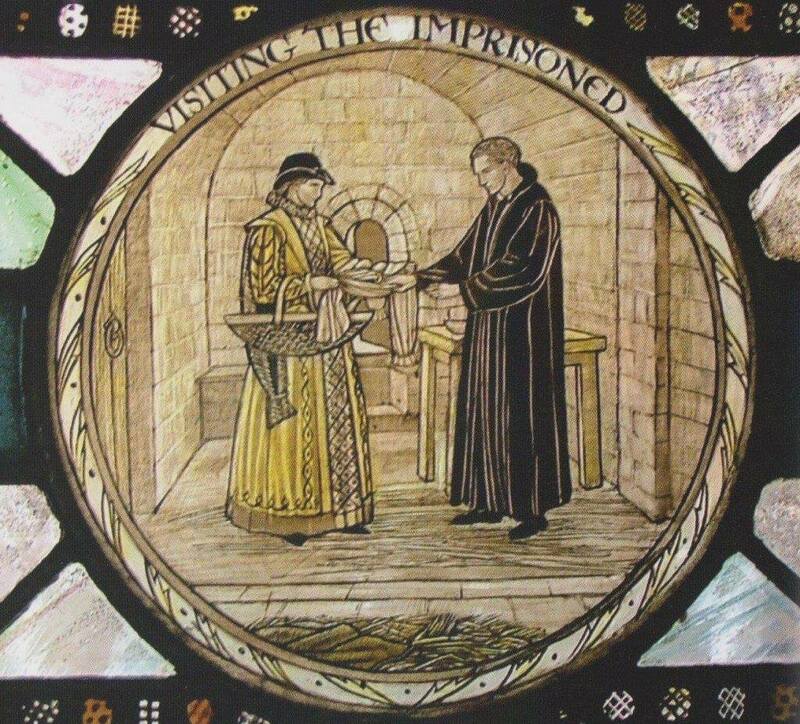 Like Ward, he was offered freedom if he asked the Queen’s pardon and promised to worship in the Church of England; he replied he did nothing against Queen and that he could not attend a non-Catholic Church. Roche was hanged 1588 at Tyburn, London, England. The English Catholic martyrs, in my opinion, ought always to amaze the believer whether he or she is English or not. All of them really lived and died in a noble way and with conviction that shames most. One of the 40 martyrs canonized at the same time (here’s the list), Margaret Ward, was killed for her faith during the era of Elizabeth I on the charge of helping Father William Watson, a Catholic priest escape. She kept Father Watson’s confidence and for that act was tortured. 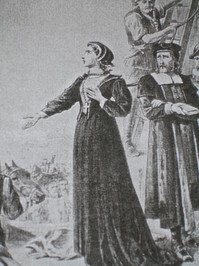 Margaret Ward, canonized by the Servant of God Pope Paul VI on 25 October 1970, is recognized as one of the Forty Martyrs of England and Wales. The Church generally recognizes the date of her canonization as her feast day. 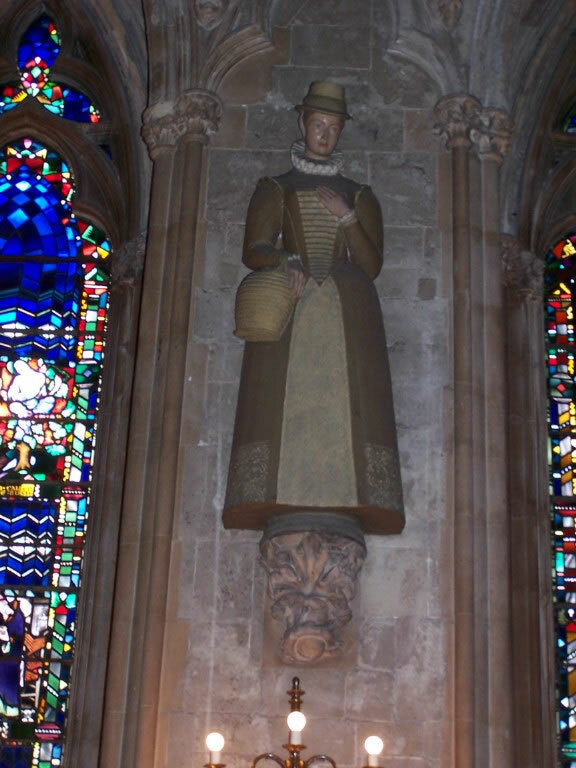 However, the Dioceses of Birmingham, Leeds and Shrewsbury liturgically recall today as the feast for Saints Margaret Ward, Margaret Clitherow and Anne Line. And, so do I. Join me in prayer for the Church of England, Scotland and Wales. My 2009 post on these women can be read here. 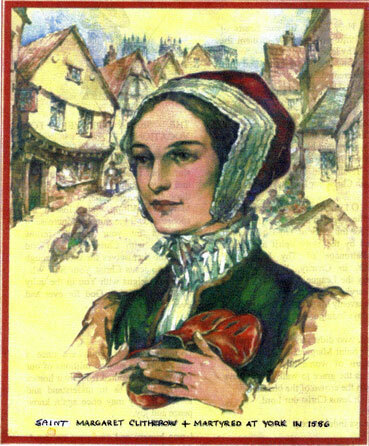 We beseech Thee, O Lord our God, grant us to revere with unceasing devotion the glorious victories of Thy holy Martyrs Saints Margaret Clitherow, Anne Line and Margaret Ward; may we at least honor with our lowly homage those whose praises we cannot sing worthily. non-attendance at church, she taught herself to read and later ran a small school for her own and her neighbours’ children. Her husband remained Protestant, but allowed her to hide priests in their house. In 1586, the secret hiding places were discovered, and Margaret was put on trial. She refused to plead, for which the punishment was being crushed to death. Saint Anne Height was born at Dunmow (Essex) around 1565, and was hanged at Tyburn on 27 February 1601. 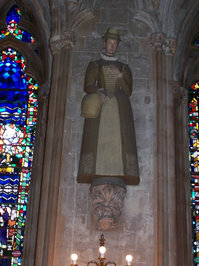 In her teens, she became a Catholic and was disinherited, and in 1585 married Roger Line, also a disinherited convert, who was subsequently imprisoned then exiled for his faith, leaving her destitute. She taught and embroidered, and also kept house for priests. After a large number of people had been seen gathering at her house for Mass, she was arrested, tried and condemned to death. For more on these 3 English Martyrs see this entry. In the Diocese of Bridgeport, those who prepare for the major seminary at Saint John Fisher Seminary, Stamford, call to mind the martyrdom of these women saints daily as their statues surround the altar. May Saints Margaret, Anne and Margaret, pray for us!! !